The new long-range nuclear-capable missile will replace the aging AGM-86B weapon system. 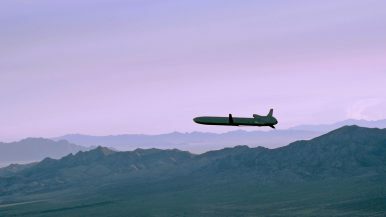 The U.S. Department of Defense (DoD) has awarded two separate $900-million contracts to Lockheed Martin Corporation and Raytheon Company for the development of the Long Range Stand Off (LRSO) nuclear-capable cruise missile, the Pentagon announced on August 23. The contracts run until 2022, when the U.S. Air Force Nuclear Weapons Center will select a single contractor to build and deploy the new weapon system. The new weapons program is part of a multi-billion dollar effort to extend and modernize the U.S. arsenal of nuclear-capable missiles. The LRSO missile is expected to replace the nuclear-armed AGM-86B air-launched cruise missile (ALCM), a weapon system first introduced in the 1980s during the height of the Cold War. “The aging ALCM will continue to face increasingly significant operational challenges against emerging threats and reliability challenges until replaced,” the U.S. Air Force said in a statement. The U.S. Air Force expects to start fielding the new LRSO in the late 2020s. Program costs are estimated at around $20 billion. Overall, the U.S. Air Force is expected to buy up to 1,000 LRSOs. The LRSO, purportedly capable of striking targets nearly 3,200 kilometers away, is to be launched from from long-range aircraft such as theB-52 Stratofortress, B-2 Spirit,and the top-secret new B-21 Long-Range Strike Bomber. The B-21 will reportedly feature stealth capability, carry both conventional and nuclear weapons, and be optionally manned. The USAF is expected to buy 80 to 100 B-21 bombers overall. Initial operating capability is set for 2025.